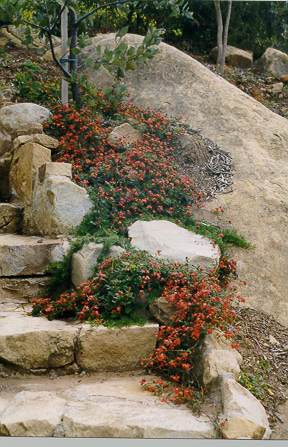 Outstanding, vigorous climber or creeper/trailing plant with trifoliate green leaves and pea-shaped orange-pink-yellow flowers. Prefers well-drained soils with a mulched root system in full sun or partial shade. Foliage damaged by moderate frost but foliage will return in spring. Pruning extends the life of the plant. Excellent container plant (especially with pruning). Propagation Information: Pour boiling water over seed and let soak overnight prior to sowing. Drench seed with a fungicide to prevent "damping off". Seed usually germinates 10-25 days after sowing.